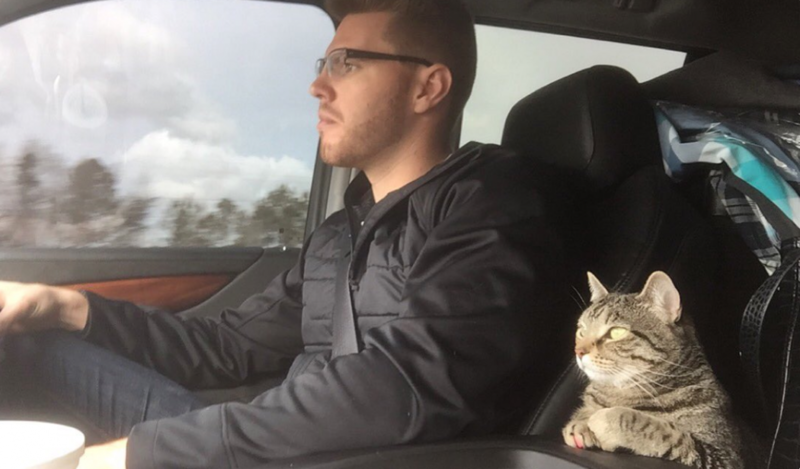 All cat lovers know how difficult it is to be separated from their feline friends, so we can’t blame Freddie Freeman for bringing his cat along for spring training in Orlando. The Atlanta Braves player and his wife, Chelsea Freeman, left for spring training yesterday with their kitty Nala in tow. While many cats may regard road trips with the same disdain they reserve for belly rubs and the neighbor’s dog, Nala seems to be downright enjoying herself, according to Chelsea’s tweets. SB Nation attributed Nala’s comfort in the car to being a “good dog,” but we suspect Nala is actually an adventure cat. After all, she certainly seems to be enjoying the ride. And as for Freddie Freeman, we think it’s pawsome that this talented athlete with a penchant for teammate hugs will be going home at the end of teach training day to hug both his wife and his cat. All little Nala needs now is a harness.